Best Prices AND Service on the Web !!! These items will be available shortly, and only for a very limited time -- order now! Please order early; supply is extremely limited on these items. 00766 -- Display with 12 "Tin-Plate" Passenger Cars. Prototype: Different four-axle express train passenger cars from different railroads used in European passenger service in the Sixties. Model: The following cars are included in this attractive display: 2 German Federal Railroad (DB) type BRbu4üm express train half dining car, 2nd class, and 2 German Federal Railroad (DB) type B4üm, express train passenger cars, 2nd class. 1 Italian State Railways (FS) type Az express train passenger car, 1st class. 3 German Sleeping Car and Dining Car Company (DSG) type WLABüm33 sleeping cars. 2 Austrian Federal Railways (ÖBB) type A4üh express train passenger cars, 1st class, and 1 Austrian Federal Railways (ÖBB) type Bc4üh express train passenger car, 2nd class. 1 Danish State Railways (DSB) type B express train passenger car, 2nd class. All of the cars have Relex couplers. Each car comes individually packaged and marked. The packaging is based on the historic design in the Sixties. Length over the buffers for each car 24 cm / 9-1/2". Car packaging in an historic design. 30080 -- DB class 01 Express Train Steam Locomotive w/Tender. Prototype: German Federal Railroad (DB) class 01 express train steam locomotive. With Witte smoke deflectors. The locomotive looks as it did around 1961. Model: This is a reproduction of a Märklin classic based on item numbers 3008/3048. The locomotive has an mfx digital decoder. It also has controlled high-efficiency propulsion. 3 axles powered. A 7226 smoke unit can be installed in this locomotive. There are triple headlights at the front of the locomotive; they will work in conventional operation and can be controlled digitally. The locomotive body and frame are constructed of metal. The wheels and valve gear are bright nickel plated like the original models. The tender has a Relex coupler. Length over the buffers 28 cm / 11". Reproduction of a Märklin classic from the Fifties. The right locomotive to go with the "tin-plate" passenger cars from the 00766 display. Packaging includes a colored representation of the locomotive, based on the historic packaging for the class 01. The class 01 express train steam locomotive can be used as an appropriate locomotive for the "tin-plate" passenger cars from the 00766 display. 31021 -- "Stuttgart Station" Steam Locomotive Set. Production limited to only 2,000 sets worldwide! Prototype: 2 different Württemberg steam locomotives. 1 class C express train steam locomotive, 1 class K freight steam locomotive. Both locomotives in a brownish green and reddish brown paint scheme. The locomotives look as they did around 1922. Model: Württemberg class C: The locomotive has an mfx digital decoder and extensive sound functions. It also has controlled high-efficiency propulsion. 3 axles powered through side rods. Traction tires. This locomotive's design does not permit installation of a smoke unit. The locomotive has dual headlights that change over with the direction of travel, will work in conventional operation, and can be controlled digitally. The headlights are maintenance-free, warm white LEDs. There is a close coupling between the locomotive and tender. The locomotive has numerous separately applied details. Length over the buffers 25.1 cm / 9-7/8". Württemberg class K: The locomotive has an mfx digital decoder and extensive sound functions. It also has controlled high-efficiency propulsion. The locomotive's frame has side play for the axles thus allowing the locomotive to negotiate sharp curves. 6 axles powered through side rods. Traction tires. A 7226 smoke unit can be installed in this locomotive. The locomotive has dual headlights that change over with the direction of travel, will work in conventional operation, and can be controlled digitally. The headlights are maintenance-free, warm white LEDs. There is an adjustable close coupling between the locomotive and tender. Length over the buffers 23.5 cm / 9-1/4". A suitable collector's display case including a presentation base for the locomotives is included. An excellent art print of a painting in water colors by the artist Peter Bomhard, who is famous for his railroad images, produced exclusively for this item, is mounted on the back wall of the display case. Both locomotives include mfx decoders and extensive sound functions. Suitable collector's display case included. An excellent art print of a painting in water colors by the artist Peter Bomhard, produced exclusively for this limited item, included. Limited edition of 2,000 pieces worldwide. Consecutively numbered certificate of authenticity included. Prototype: German Federal Railroad (DB) class 38.10-40 passenger locomotive. Former Prussian P 8. Boiler with 3 domes and Witte smoke deflectors. Type 2Ž2ŽT 30 tub-style tender. Model: The locomotive has an mfx digital decoder, controlled high-efficiency propulsion, and extensive sound functions. 3 axles powered. Traction tires. A 72270 smoke unit can be installed in this locomotive. The headlights are maintenance-free, warm white LEDs. The headlights and the smoke unit contact will work in conventional operation and can be controlled digitally. There is a close coupling between the locomotive and tender. The locomotive has a detailed engineer's cab. Brake hoses, prototype couplers, and protective sleeves for the piston rods and included and can be installed on the locomotive. Length over the buffers 21.0 cm / 8-1/4". Version with a prototypical tub-style tender. Controlled high-efficiency propulsion and extensive sound functions. Prototype: German State Railroad Company (DRG) class 05 express locomotive. Version in black with full streamlined fairing. Model: The locomotive has an mfx digital decoder and extensive sound functions. It also has controlled high-efficiency propulsion with a bell-shaped armature, in the firebox. 3 axles powered. Traction tires. Closed side streamlined fairing without additional cutouts. This locomotive can negotiate curves with a minimum radius of 360 mm / 14-3/16". The headlights are maintenance-free warm white LEDs. The headlights work in conventional operation and can be controlled digitally. A 7226 smoke generator can be installed in the locomotive. The tender is constructed of metal. There is a permanent close coupling between the locomotive and tender. The decoder is accessible under the hatches on the tender that can be opened. Length over the buffers 30.7 cm / 12-1/16". Special Export item for the Benelux countries -- now available! Prototype: Dutch State Railways (NS) class 4900 (former class 50) freight train steam locomotive, with a coal tender as standard design type 2Ž2ŽT26 box-style tender in its original design. With Wagner smoke deflectors, standard engineer's cab, long walkway that is angled at the front to the smoke box, DRG lanterns, and without an inductive magnet. Road number 4906. The locomotive looks as it did around at the end of the Forties. Model: The locomotive has an mfx digital decoder and extensive sound functions. It has controlled high efficiency propulsion with a bell-shaped armature and a flywheel, mounted in the boiler. 5 axles powered. Traction tires. The locomotive and the tender are constructed mostly of metal. A 7226 smoke generator can be installed in the locomotive. The dual headlights change over with the direction of travel. They and the smoke generator contact will work in conventional operation and can be controlled digitally. The headlights are maintenance-free, warm white LEDs. There is a close coupling with a guide mechanism between the locomotive and tender and it can be adjusted for curves. The front of the locomotive and the back of the tender has a close coupler in an NEM pocket with a guide mechanism. Minimum radius for operation is 360 mm / 14-3/16". Piston rod protectors and brake hoses are included. Length over the buffers 26.4 cm / 10-3/8". 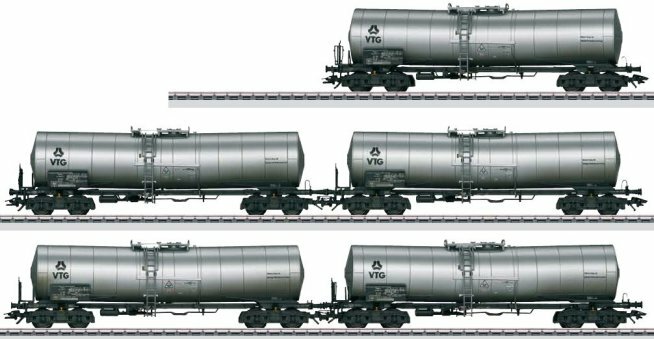 Prototype: 5 different chemical tank cars painted and lettered for VTG AG, used on the German Federal Railroad (DB). Insulated tanks. The cars look as they did in 1988. Model: The cars have detailed, partially open frames. They also have type P65 trucks. All of the cars are authentically weathered. All of the cars come individually packaged with a master package. Length over the buffers for each car 18.0 cm / 7-1/16". DC wheel set for each car 4 x 700580. Prototype: Type Fas 126 side dump car as a privately owned car painted and lettered for the Märklin Magazin, Göppingen, Germany. The car looks as it did in 2011. Model: The hopper can be tipped to both sides and has a guide mechanism. The car has moving compressed air cylinders and hydraulic rams. Two movable unloading hatches on both sides. Length over the buffers 14 cm / 5-1/2". DC wheel set 2 x 700580. Prototype: Low side car loaded with a 20 foot container. Model: The car has a special paint scheme. The container is designed as a Märklin Kids Club clubhouse. The car has Relex couplers. Length over the buffers 11.5 cm / 4-1/2". DC wheel set 2 x 700580. Prototype: 3 German Federal Railroad (DB) Leig-Einheit / less-than-carload-lot type Hrs-z 330 (former Gllmghs 37) pairs of cars. Redish brown basic paint scheme. The cars look as they did in the mid-Seventies. Model: The cars in each pair are permanently coupled together and are connected by a diaphragm. The cars have older design buffers at the outer ends of each pair of cars. One car in each pair of cars has a brakeman's platform. The cars have different car numbers. Each pair of car comes individually packaged, and there is a master package. Length over the buffers for each pair of cars 26.8 cm / 10-9/16". DC wheel set for each pair of cars 4 x 700580. Prototype: Type OOTZ hopper car. Model: The car is painted and lettered to fit into the series of Märklin Magazin annual cars. Length over the buffers approximately 47 mm / 1-7/8". One-time series, only in 2012. Prototype: 4 WLE type Falns hopper car. Model: All of the cars are finely painted and lettered like the prototype. Each car has its own car number. Length over the buffers approximately 210 mm / 8-1/4". This car set goes very well with the 88884 locomotive. Prototype: Swiss Federal Railways (SBB/CFF/FFS) class Re 4/4 II general-purpose locomotive in a green paint scheme. Model: This locomotive is finely detailed, completely new tooling. It has a 5-pole Mini-Club motor. All axles powered. The headlights are maintenance-free, warm white LEDs, (3 white lights in the front, 1 white light in lower right rear, Swiss headlight / marker light code). The pilots pivot out with the trucks. The current pickup can be switched between catenary and track. Length over the buffers approximately 75 mm / 2-15/16". Prototype: German Federal Railroad (DB) class 03. Standard design locomotive with a welded tender and Wagner smoke deflectors. Model: The locomotive is mostly new tooling and is finely detailed. The locomotive body is constructed of metal. It has extensive imprinting. The locomotive has a reproduction of the brakes, inductive magnet, etc. on the underside. It has finely detailed valve gear and main and side rods. The buffer plates have been made larger. There is a shorter spacing between the locomotive and tender. The locomotive has a 5-pole motor. All 3 driving axles powered. The headlights are warm white LEDs. The tender has spoked wheels. Length over the buffers approximately 112 mm / 4-3/8". Metal locomotive frame and body. Finely detailed side / main rods and valve gear. Reproduction of the brake rigging, inductive magnet, etc. Window inserts on the engineer's cab. Model: The locomotive has a DCC digital decoder and extensive sound functions. It also has controlled high-efficiency propulsion with a bell-shaped armature, in the firebox. 3 axles powered. Traction tires. Closed side streamlined fairing without additional cutouts. This locomotive can negotiate curves with a minimum radius of 360 mm / 14-3/16". The headlights are maintenance-free warm white LEDs. The headlights work in conventional operation and can be controlled digitally. A 7226 smoke generator can be installed in the locomotive. The tender is constructed of metal. There is a permanent close coupling between the locomotive and tender. The decoder is accessible under the hatches on the tender that can be opened. Length over the buffers 30.7 cm / 12-1/16". Model: The cars have detailed, partially open frames. They also have type P65 trucks. All of the cars are authentically weathered. All of the cars come individually packaged with a master package. Length over the buffers for each car 18.0 cm / 7-1/16". AC wheel set for each car 4 x 700150. Prototype: WLE (Westphalian State Railroad) class ER 20 general-purpose locomotive with diesel-electric drive. Model: The locomotive has a 5-pole motor. Both trucks powered. The headlights are maintenance-free LEDs. The locomotive has a prototypical paint scheme and lettering. Length over the buffers 87 mm / 3-7/16". This locomotive makes the perfect add-on for the 86309 car set to make a complete, prototypical train. One-time series for the 2012 MHI. Model: This sis the German State Railroad (DRG) Era II class 99.750-752 tank locomotive (K 33.6, Saxon IK). Various class IK units came to the German State Railroad at the beginning of the Twenties. They were later designated as road numbers 99 7501 to 99 7527. This model of the locomotive is new tooling and has sprung buffers, traction tires, a DCC connector, built-in engineer's cab lighting, and a smoke generator. The headlights change over with the direction of travel. All axles are powered from a powerful Buhler motor. Length approximately 28 cm / 11". Model: This is an authentic reproduction of one of the legendary Rhaetian Railroad Crocodiles, in a brown paint scheme with a new road number 404 that has not been used up to now. This model can be used in Eras I to IV in this paint scheme. The original unit was retired in 1984 and later scrapped. This model features a high level of pulling power due to two powerful Buhler motors. The locomotive has tow general-purpose electrical sockets. Traction tires. Weight approximately 3,450 grams / 7 pounds 8 ounces. Length over the buffers 56 cm / 22". 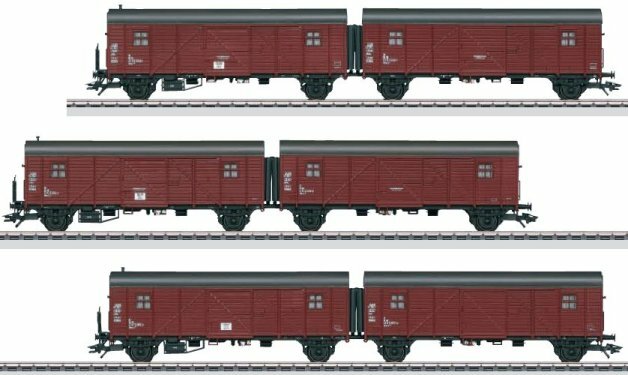 Model: This freight car set consists of 5 two-axle freight cars. There are 2 boxcars, 1 low side car, 1 high side gondola, and 1 baggage car. The cars look as they did in early Era II. All of the cars are prototypically lettered. The doors on the boxcar and the baggage car can be opened. The low side car and the gondola have a floor that is a different color from the rest of the car. All of the cars are individually packaged. Length over the buffers for each car 30 cm / 11-13/16". The 20985 locomotive can be added to this freight car set to make up a prototypical freight train. Prototypical paint schemes and lettering. All of the cars are individually packaged. Model: This is a multi-colored starter set consisting of a battery-operated tank locomotive, an open-air observation car, and a dump car in the proven LGB quality. The locomotive has three speed levels forward and reverse and 4 sound functions. A complete circle of plastic track is also included (external diameter 1,290 mm / 50-7/8"), as well as a wireless, infrared controller, and the necessary batteries (3 each size C and 2 each size AAA). Train length 57 cm / 22-7/16".